Any car we purchase must be in excellent condition mechanically, structurally and cosmetically, have a good service history, clear HPI report and show clear physical evidence of having been well cared for throughout its life. Wherever possible we like to purchase cars direct from owners who have kept them for some years, so we can get an impression of the lifestyle they have been part of, and which will have influenced their current condition. Our specialisation in a narrow range of models from the same manufacturer means that we see many examples of each type. This has enabled us to build up detailed knowledge of failure patterns, wear points and other essential pre-purchase checkpoints for each model. Individual car buyers, and even other dealers who do not specialise as we do, cannot hope to bring this level of experience to bear when identifying which cars to purchase and what preparation is needed. Many of the cars we supply will have lower than average mileage, but this is not a prerequisite as the Mercedes-Benz marque is renowned for its long life and durability. See The Great Mileage Debate. Because the cars are of a greater age than typical main dealer stock we pay great attention to the structure of the vehicle, and any previous accident damage or corrosion which may have occured. Cars with significant corrosion or evidence of badly repaired accident damage are rejected. Before we offer a car for sale, we subject it to a full mechanical check comparable to the used car check carried out by Mercedes-Benz dealers. This is done in our own workshop by Mercedes trained technicians. Even the most cherished car may have minor cosmetic defects to paint, trim or bodywork which need to be put right. Where necessary this is attended to by an expert bodyshop, who are specialists in the restoration of older Mercedes models. We aim to hand over cars to their new owners in a physical and mechanical condition which is as near as possible to when they were new, though of course some diminution of quality must be expected relative to the age of the vehicle, its mileage and its current value in the marketplace. Components found to be worn or inoperative on inspection are repaired or renewed as appropriate using genuine Mercedes parts or original equipment quality equivalents. Occasionally on a lower value or higher mileage car it is not economically viable to correct certain superficial defects within the asking price, but a cost option can be given to remedy them if required. You are welcome to have an RAC etc. engineer’s inspection done on your chosen car, but we would like you to do this before purchase rather than after. Backing this up is a comprehensive warranty which, unlike the majority of insurance backed warranties, is simply worded with no small print, and is designed to put things right if they fail. We underwrite this warranty ourselves, unlike the majority of dealers, which means firstly that we have every incentive to ensure that the cars are properly checked before sale, and secondly that if important components do fail they will be put right. 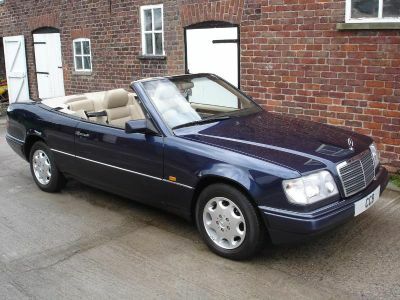 We only sell Mercedes cars of the 1990s and earlier (though we will take other makes in part exchange). We believe that specialisation is the only way to attain the required level of knowledge to serve our customers properly. We have been accumulating that knowledge for more years than we care to remember, though we are always learning new things. Our goal is to supply cars which are a viable alternative to any current model, but with the style, exclusivity and build quality which is no longer available. Whilst some of our customers will use them sparingly and save them for weekend and holiday use only, we equally expect many to use them as their sole means of transport and embark on regular continental tours with complete confidence, as we do ourselves! Our prices are not the lowest in the industry, but neither are they the highest. However, having purchased one of our cars, its new owner should be assured of safe, trouble-free service and minimal unscheduled expenditure for many years to come.